Buses are involved in road accidents at a disproportionate rate reports the Ohr Yarok organization. In 2018, 33 people were killed in road accidents involving buses, a figure similar to the number of fatalities in bus accidents in 2017. The two fatalities in the overturn of the bus on Sunday on Route 443 add to the bloody statistics. In 2017 buses were the most heavily involved vehicles in road accidents compared with all vehicles in Israel – 76.2 buses per 10,000 vehicles were involved in the most serious road accidents (more than private cars with 6.7, motorcycles 49, and trucks over 34 tons – 28.8). An examination of the data on bus involvement in fatal road accidents shows that in this category buses are also in first place – 12.4 buses per 10,000 bus vehicles were involved in fatal road accidents in 2017, more than trucks over 34 tons – 11.3 and trucks up to 34 tons – 5.4. Gil Beilin, founder and chairman of the road safety organization, a former military accident investigator, recalls that a bus is a very heavy vehicle, with a high center of gravity: “A small change of the wheel, and it can be fired into a difficult situation that cannot always be safely extricated. Even if the driver already feels the danger, the reversal may be unavoidable.” He notes that in the event of such an accident, additional factors unique to the bus, such as the dozens of passengers inside it, as well as the fact that they are not seat-belted. Speaking to Walla News, he added, “The serious accident yesterday proves that we are not dealing with the road and not a separation fence, but the road at the scene of the accident was spacious and new and with excellent separation between the lanes,” Beilin said. “The driver is the cause of most road accidents, the human factor is responsible for hundreds of deaths every year and tens of thousands of injuries every year,” he said. Dr. Moshe Becker, another expert in transportation safety, adds, “There is a problem with drivers. There is a decline in the number of certified experienced bus drivers. The transportation industry in Israel has undergone privatization and issuing tenders, a split that led to all the new [bus] companies, all trying to attract drivers, and this has led to compromised experience and quality of the drivers”. 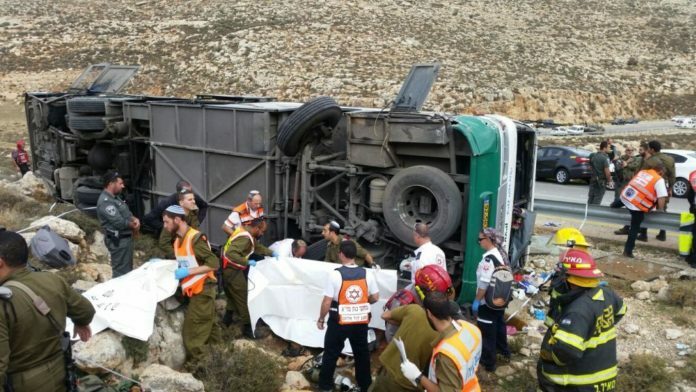 According to him, striking another vehicle can cause internal movement of those inside, and injury of passengers, which can lead to fatal consequences as was the case in the accident on Sunday, which claimed the lives of two women from Modi’in Illit. The Association of Transportation Drivers in the ‘Power for Workers’ Organization shares the sorrow of the families of the victims and wishes a speedy recovery to the driver and the injured passengers. “It is regrettable to find that even at this difficult hour, even before the circumstances of the accident are clear, an accusatory finger is pointed at the bus driver. We call on the relevant authorities to show responsibility, to investigate the accident and avoid premature and irresponsible charges”. Next articleWill Likud be Compelled To Conduct A Recount Following Party Primaries? I noted that many Jerusalem bus drivers drive very fast…. For years I’ve been asking WHY there is no law requiring intercity buses to have seatbelts. Is it total disregard for the lives of “the little people”? What could possibly be the reason for this horrific negligence?! Hoping that our lawmakers take note and fix the situation asap!!! Israeli buses should also all have seat belts installed.